If yesterday had been your last day on earth, would you feel happy about how you lived it? This might sound like I’m heading down the path of live each day as if it were your last. I’m only kinda-sorta going there. Personally, I want to put my energy, time, and attention on what matters most, living my day the way I want to live my life. But I also want to deal with the ordinary, practical considerations of life, since I’m betting that I probably will be here tomorrow. If today was my actual last day, I’m certain I wouldn’t spend it paying bills or buying groceries, but considering the consequences – and that I expect to be around for those consequences – I think I’ll write the checks and go shopping. So I don’t literally want to live each day as if it were my last. What I really want to do is to climb into bed each night feeling good about the choices I made, ending the day with no regrets. Enter a mild case of scattered and discombobulated. That’s how I’ve been feeling for almost a month. I can’t put my finger on why, and I can’t seem to shake it off. But if yesterday had turned out to be my last day, scattered and discombobulated is NOT how I’d want to have lived it! 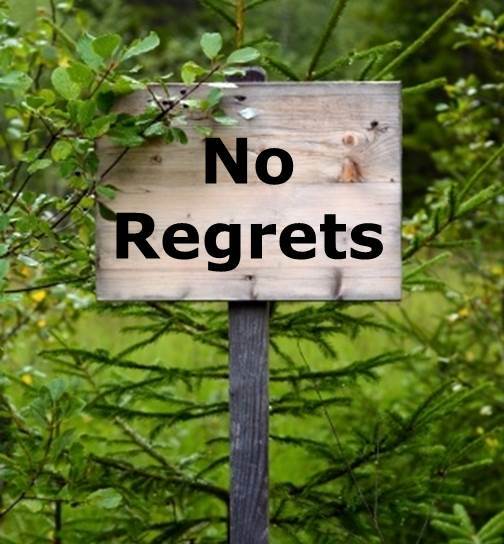 I invite you to join me in the no-regrets challenge. For the next eight weeks, focus on ending each day with no regrets – whatever no regrets means to you. Why eight weeks? Because change doesn’t happen overnight. And because it takes time to learn what works for you and create new habits. You don’t need much to get started; just a notebook or a document on your computer where you’ll take daily notes, plus a willingness to pay attention to what you do and the choices you make. What choices did you make today that supported you in living a no-regrets day? 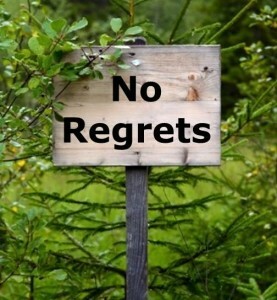 What opportunities did you miss to live a no-regrets day today? What will you do differently tomorrow? What successes will you build on? She realized her no regrets commitment meant getting herself out there instead of wishing about it. An executive who frequently works from home, she won the tussle with her inner critic, who tried to insist it was irresponsible to take a conference call in such an enjoyable environment. It was an eye-opening moment for her. One clue you’ve bumped into a made-up constraint or self-imposed rule is when you find yourself having one of these “I wish I could” experiences. You don’t need a fairy godmother to grant those wishes! Friend, parent, spouse, significant other, employee, boss, business owner, sibling, pet owner, runner, orchid collector, volunteer, community member … you have many roles in your life. It’s easy to prioritize what’s most urgent, but that’s not always what’s most important. 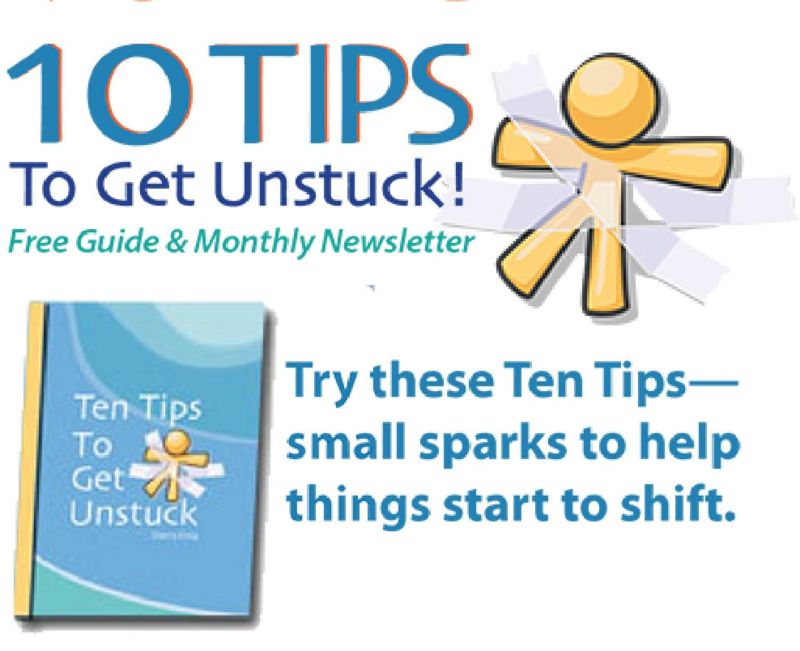 So make a list of the roles you’re committed to at this point in your life, and be sure you’re clear on what trade-offs you’re willing – or not willing – to make. Sometimes just taking a brief moment to imagine yourself a year down the road can help put your priorities in perspective. As I kid, I frequently heard my grandparents talk about all the places they’d go later, when they had more time and fewer responsibilities. My grandmother died at the age of 61. “Later” never came for her, and my grandfather spoke with great regret of their missed opportunities. As you find your own balance between today and tomorrow, be sure you make the trade-offs that create the fewest regrets. One last thing … don’t beat yourself up if you’re not perfect. It’s all about moving towards no regrets one choice at a time. Besides, treating yourself unkindly will just be one more thing to regret!